Welcome to our third 'Did You Catch That!?' article capturing the action from Week 2 in the Big Brother House. I'll be covering everything that's happened since the 1st Eviction of the season on Thursday night up until Tuesday night in the BB house. I'll include all the Live Feed action and newest episodes covering the new HOH's, nominees, Battle of the Block and PoV spoiler. But first, we start with Wednesday Night's show which happened after I posted my previous article. 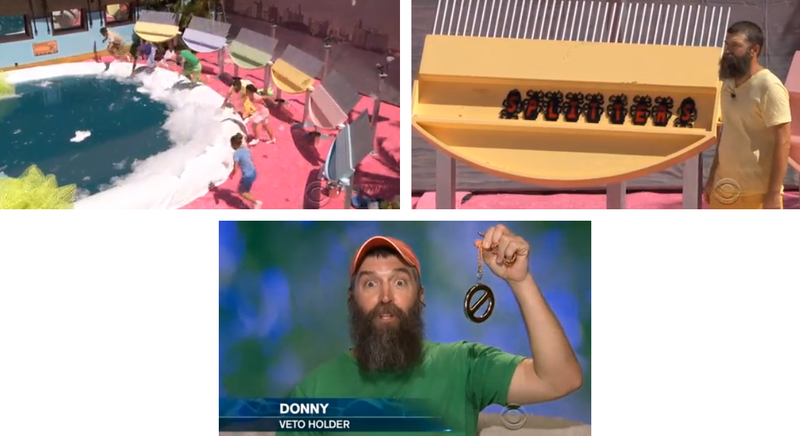 We got to see Donny pull out his PoV victory allowing him to save himself from the block. Caleb then replaced him with Joey because she tried to start an all girl's alliance. Caleb and Devin, who have been running the house thus far, we're 100% convinced that Donny was ex-military and decided he was their target so it was critical for Donny to pull out the PoV. Most of the PoV players didn't even manage to get a word spelled somehow. To no surprise, Joey was the first HG evicted from the Big Brother 16 house. I'm personally shocked that turning into Alex and trying to from an alliance with 50% of the house on a whim didn't work out for her. It was painfully obvious she had never seen the show before and couldn't even guess the two women in the Bomb Squad given 3 tries from Julie in the post-eviction interview. Julie let her know about an undercover cop and a pop star's brother being in the house and told us we would still be getting 3 new Team America alliance members with Joey being evicted first. 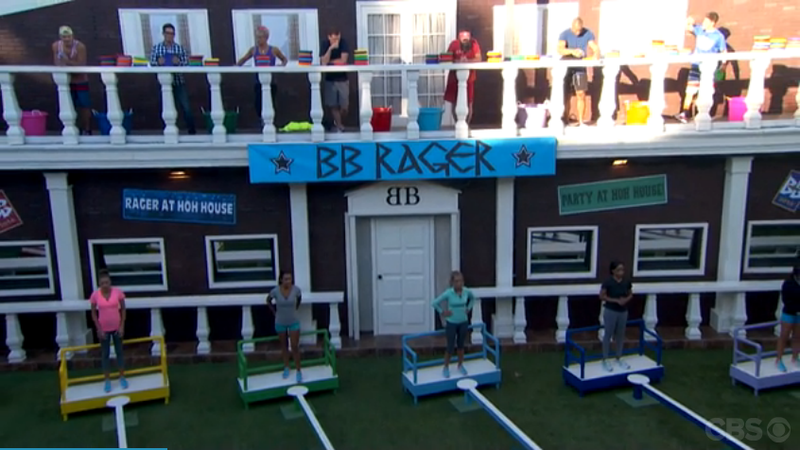 It's Greek Week in the Big Brother 16 house with our new HOH competition called BB RAGER. The HG's had to go retrieve 6 Kegs and return them while walking a balance beam to get there and back. This was a two-part HOH with the men competing after the women. The HG's not playing in each competition were able to throw discs at the competing HG's from the balcony. I know Zach later admitted to throwing all of his discs at Victoria, which she complained about. Amber easily won the women's competition and became the first HOH of the week. She made it look easy with Nicole and Christine not too far behind while Brittany was the one HG to DQ as she let her keg hit the ground. The men's competition was a bit more complicated. Hayden was coming back down after delivering all 6 kegs and fell off at the last possible second, giving the competition to Cody who was right behind him. Cody was now our 2nd HOH of the week...or so we thought. Julie came back and told the HG's that Cody's foot actually hit the ground before he hit the buzzer and now Devin joins Amber as the 2 HOH's for the week. It was a looong night for the HG's after the live show on Thursday and an entertaining one for the viewers. 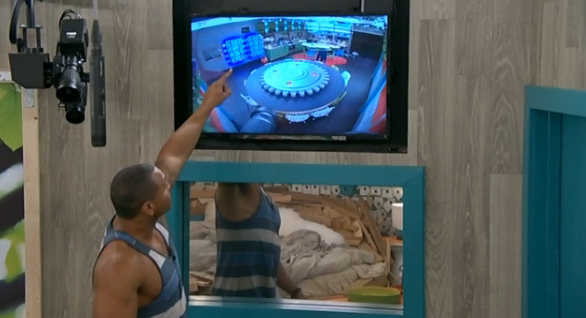 About 10:30 PM BBT Derrick saw the TV say "Nominations Today" which made everyone go nuts. Devin and Amber were up in the HOH room talking about who to put up with Derrick and Caleb on hand. It was mostly Derrick's doing to have Amber put up Hayden and Nicole. Devin knew he wanted to put up Paola and Brittany. Amber seemed ok with putting up a strong duo to beat Paola/Brittany and dethrone her from HOH, giving Devin the power all week. At this point in the week, Brittany is Devin's #1 target. Derrick did a nice job convincing everyone that Nicole is a floater and Hayden was the only guy she could put up outside the Bomb Squad, and she wasn't putting up Donny. With Nicole/Hayden and Paola/Brittany nominated, now in the middle of the night, Big Brother kept everyone awake with different messages through the loud speakers. Meanwhile, Devin is convincing Paola to throw the competition so her and Brittany stay on the block and Brittany goes home. The loud speaker messages starting around 3:00 AM BBT and continued for over an hour. They all figured the messages were important to remember for the Battle of the Block competition. When the feeds came back around 6:00 AM BBT we learned that Amber's nominations, Hayden and Nicole, won the Battle of the Block, ensured their safety, and dethrone Amber from HOH. Devin will be HOH this week with Brittany and Paola on the block, and Brittany fearing her days are numbered. Zach and Cody meet in the Have-Not room to talk about the game plan this week, pump the Bomb Squad into Devin and make sure they are safe. They discuss bringing in Brittany, Jocasta and Donny to turn the tables next week and tell the cameras, "Watch out, we're coming for ya." Friday morning we had Cody, Hayden and Donny sitting around the kitchen table as the only 3 HG's awake. They all discuss how the line has been drawn, they need to get out Devin and Caleb. Zach is asleep but is on the same page as these 3. They also talk about how aware they are of how impressive Frankie and Derrick's social games are, top 2 in the house. I wouldn't say there was an alliance formed but they all have an understanding and are on the same page. The young guns head to bed finally and Donny is the only one awake as he proceeds to walk around waving at the cameras. The HG's slept for a few hours before being woken up around 1:00 PM BBT. The HG's are talking about who might be put up if either Brittany or Paola wins the PoV. Devin is currently saying he'll replace one with Victoria if he needs to. The Bomb Squad is still kinda together only because Devin is HOH this week. For the most part everyone in the alliance is just saying that to keep Devin happy but there are plans to go after him in the next few weeks. Devin is talking to Derrick and Frankie in the HOH telling them it was all his plan to have Pao Pao throw the BoB competition so Brittany will go home, but not to tell anyone else. Poala comes in the room and all 3 guys assure her that she is safe and valuable as a pawn. Devin later tells Zach that Victoria is the target if Brittany wins PoV. Zach and Frankie meet up in the storage room and discuss joining up with Donny to take out Devin. Zach tells Frankie they should take out Victoria and reel in Donny/Brittany to take on Devin. Derrick and Cody have a discussion upstairs by the chess board about being careful what they say to Hayden because he's playing them. Derrick takes the info from Devin and tells Cody about Pao Pao throwing the BoB and Hayden knowing he was safe. Now they know Hayden was playing them by acting dumb in their previous conversation. They need to keep him close for now and keep the Bomb Squad idea alive, both agree Zach is on the bottom. Caleb and Amber are in the backyard talking by the hammock. Amber is over Caleb's weird conversation when he told her he liked her and now they seem to be good buddies. Caleb's filling her in on Devin's plans for the week. She puts up with Caleb pretty nicely, I have to believe she's just playing him because if she wasn't putting up with it she'd be target #1. They were pretty much talking by the hammock all night and apparently at some point Caleb dared Amber to jump in the pool with all her clothes on. All we heard was Amber saying off screen, "I told you not to dare me Caleb." Later on that night around 3:00 AM BBT, Caleb and Devin got into a fight out in the backyard. It started with Caleb telling Devin his nominations were too personal and how the women in the house were afraid to talk to him because of how he treated them and talked to them. Devin wasn't pleased with Caleb telling him this and said they must be making it up. Caleb tells Devin there are members of their alliance that don't want Brittany to go home. Devin also called Christine out to the backyard to explain why she was scared during their most recent conversation. After questioning her, Devin concludes that Christine is just making things up and heads inside. Devin comes back outside and tells Caleb the alliance is done! Caleb says that's fine and now Devin is going home next week. Frankie talks to Devin inside for a while, comes back out and tells Caleb that Devin doesn't want to blow up the Bomb Squad and to play off the broken alliance just being between the two of them. Frankie also tells Caleb that they are losing a Bomb Squad member as soon as they can get Devin out of the house, most of the house is scared of him and wants him gone next. Most of the HG's are up pretty late into Saturday morning, as they do pretty much every night. Big Brother wakes up the HG's early Saturday morning and tells them they'll be picking players for the PoV soon. Christine fills in Nicole on what happened the night before as she was one of the only HG's asleep at the time. The plan for now is to evict Pao Pao in spite of Devin wanting Brittany to go home. Zach, Cody and Derrick seem interested in saving Brittany this week but there is still plenty of time for something to happen. Going into the PoV it still seems the Bomb Squad is in tact for what it's worth. Most of the house wants Devin out but he is HOH. Cody has two pretty tight alliances with Zach and Derrick. Hayden and Cody both have something going with Nicole. Christine seems to be aligned with Derrick, Cody and Zach from the Bomb Squad. Christine also has a 3-person alliance with Hayden and Nicole. Frankie and Zach still seem to be a strong duo but Frankie is with everyone, especially Christine it seems like. We find out Derrick, Zach and Amber get to play in the PoV with Devin, Brittany and Paola. Donny is the host because Devin says he owes him so much for doubting who he is. At this point Devin still plans on putting Victoria if needed as a backup plan. There is an important conversation between Caleb and Devin before the PoV competition where Caleb tells him that people are talking about putting him up next week and that Cody, Derrick and Zach won't vote out Brittany. This is all news to Devin, then Caleb tells him that Zach is the one leading the charge to put him up next week. Devin then calls a Bomb Squad meeting where Cody and Zach tell him they want Brittany to stay this week. The feeds come back and we learn Devin has one the PoV. We see him talking to Frankie about whether or not he should save a nominee to take out Victoria or try and get Brittany out. The plan is to take Brittany off the block and put Victoria up in her place. As Devin and Brittany have a long talk to hash things over up in the HOH, Zach is telling Frankie he's paranoid because Devin told him he doesn't trust him. Frankie tells Zach he needs to start lying to Devin and stop telling the truth to get him all riled up. Frankie and Christine have a conversation about how weird Zach has been acting and how he and Cody are letting the game get to them. Christine says Cody is too close to Brittany and they should vote her out. I can never tell who Christine is being real with, pretty sure the only person she's loyal to is Nicole. Later on in the Hive Room Zach is telling Derrick he is ready to blow up the Bomb Squad, says he's over it and doesn't care. Zach is telling Derrick that he's going to call out the Bomb Squad members and expose Frankie for what he is. The consensus feeling is getting Devin and Caleb out of the house and going out in style as far as Zach is concerned. He says he's ready to be the sacrificial lamb if it means he can put Devin, Caleb and Frankie on blast. 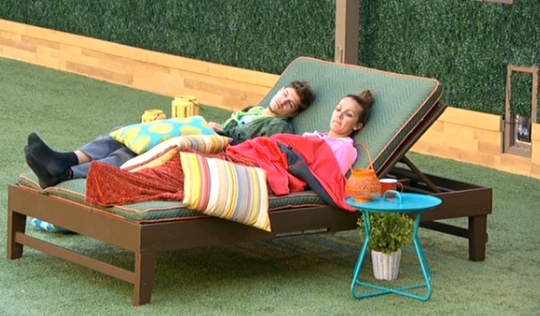 Zach and Brittany are still up in the backyard around 8:00 AM BBT talking about how bipolar Devin is. They're both on the same page moving forward and seem interested in working with each other. Frankie wakes up and joins Zach in the backyard with him still being awake from the night before. 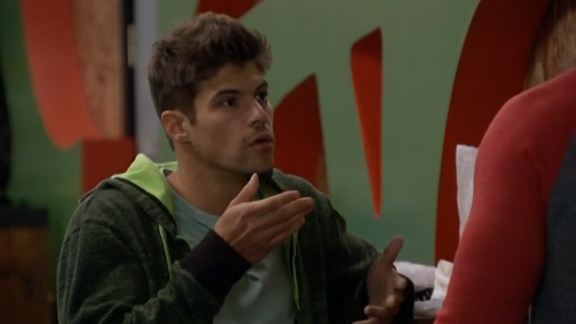 Zach starts telling Frankie about his plan to put Devin on blast, he wants to say something that will make Devin snap. Zach plans on exposing the Bomb Squad if Devin tries any funny business. Everything starts falling into place when Devin calls out to Zach in the backyard and asks for a talk. 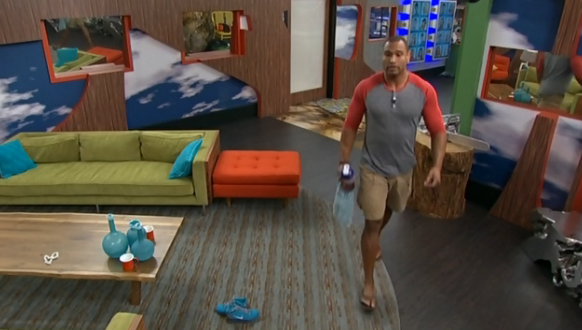 Zach says maybe in a bit and Devin closes the door pissed off. Frankie is up in the HOH talking to Devin about his loyalty to him and Caleb while throwing Zach under the bus. It seems Zankie is officially over as he tells Devin that Zach is the one going around telling everyone to put up Devin next week. Devin tells Frankie that Zach is going up now and the alliance is now down to 7, Frankie pushes for a blindside. Devin is now telling Amber that out of the Bomb Squad he only trusts her, Caleb, Frankie, and Christine only, and later tells Christine the same thing. He seems to have separated from Derrick, Cody and Zach at this point while those 3 guys have Nicole, Hayden, Brittany and Donny on their side. Zach seems to be trying to get up on the block at this point. 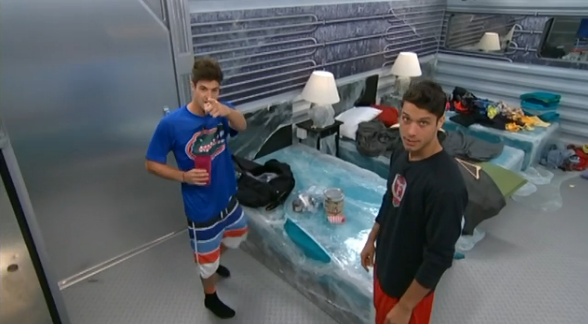 Devin asks him if he has time to talk now and Zach responds with "I don't feel like it right now." Devin says to himself that Zach is going up on the chair next to Pao as he walks away from the short convo. Devin has been giving Zach a few chances to talk about their differences but Zach wants nothing to do with it. He seems content with going up as the replacement nominee and blowing Devin's game up during the PoV ceremony. Outside in the backyard Cody and Christine are talking about how Frankie is fully in with Devin/Caleb and working every side of the house. It's nice to see people start to realize what's going on in the house. Although I can never tell how truthful Christine is when she's talking to people, I guess that's a good thing for her. Cody isn't planning on turning on Zach and is on board to take on the other side with him. Zach and Devin finally have a talk before the PoV ceremony about what's happening between them. This all stemmed from Devin telling him he didn't trust him and it's sent Zach off in a tail spin. Devin was trying to tell Zach how to deal with arguments in the house and Zach kinda loses it. Zach says he's been nothing but loyal to him and maybe he should just put him up. Devin says it never even crossed his mind until Zach mentioned it, which is a blatant lie. Devin tells Zach he doesn't act like a man doesn't own up to things and then two seconds later he's telling him how good of friends they'll be outside the house. Zach keeps telling Devin to put him up on the block if he doesn't trust him, basically daring him to do it. Devin keeps asking Zach why he would put him up and how it's not an option but Zach knows it was always in the works and doesn't care anymore. Caleb tells Zach it would be a huge mistake for Devin to put him up this week, that they need to stick to their 3 week plan as an alliance. Zach and Cody are now talking in the Have-Not room. Zach says as soon as Devin says the works "I've decided to use the PoV" he will put Devin "on blast" in front of the whole house. Cody says to definitely not do that. Elsewhere on the Live Feeds, it's picture time in the Big Brother photo booth, and the HG's are playing bags out in the backyard. Nice to have some activities for the HG's to do on this nice Sunday afternoon before Devin does his PoV ceremony business. Later on, Zach is telling Derrick his plans for the PoV ceremony in the Have-Not room. Derrick tries to settle him down and tells him not to do anything he'll regret. Meanwhile, Frankie and Caleb are in the backyard both agreeing that Devin will mess up the nominations. They're both ready to send Zach home if he goes up. In the other room, Cody and Zach are talking about going after Frankie and Devin now. Frankie has Devin up in the HOH room later and is telling Devin everything Zach told him earlier this morning about his plans for the PoV ceremony. 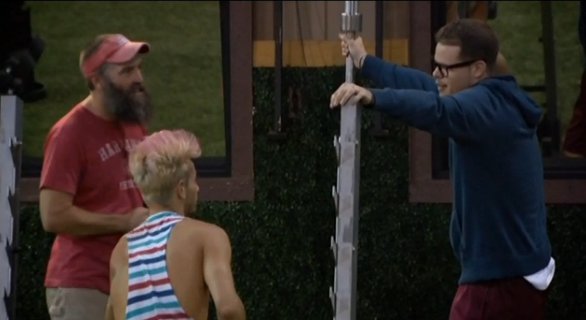 Frankie is pissed off that people are protecting Zach when he said he wants to go home. We had a Team America sighting on Sunday Night in the backyard. Derrick, Donny and Frankie got together by the weight bench all saying how cool it was that they where chosen. Derrick, "America has spoken, couldn't have a better idea for an alliance than America telling us who we're gonna work with." Team America says they'll meet up later and it's nice to know how America feels towards them as players. They seemed to all be in agreement to stick together because America has chosen them and it appears Frankie has fallen into yet another alliance. Frankie and Derrick meet later without Donny in the storage room and talk about how he's not as influential as they are. They hash out a few things and say they'll stay tight with each other. 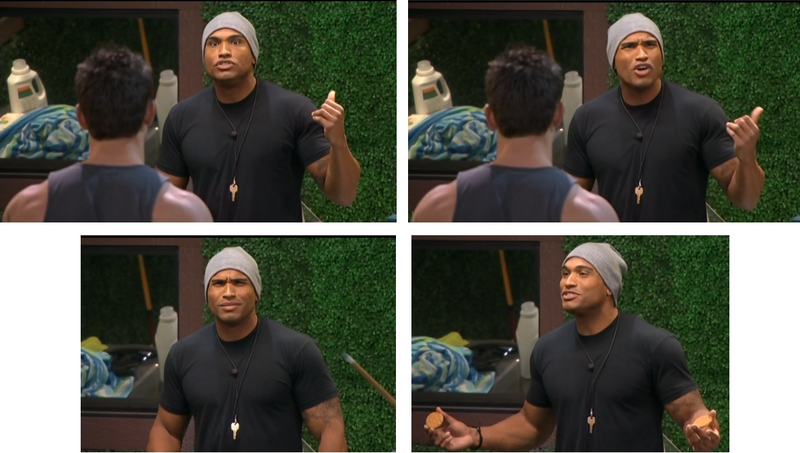 Devin and Derrick are talking up in the HOH about his plans for the PoV Ceremony. Devin's telling Derrick that Zach is too much of a wild card and says they have the votes to get him out. Later on in the backyard, Cody tells Brittany Devin came up to him and said he had a crush on her. Now Brittany says she has an announcement to make during the PoV Ceremony. This should be a very interesting PoV Ceremony to watch on Wednesday Night's episode. In tonight's episode we got to see Amber and Devin's nominations of Hayden/Nicole and Pao/Brittany. We also got to see Hayden and Nicole win the Battle of the Block competition. The HG's had to watch a TV and answer questions about the pictures they were shown. We got to see the alliance of Christine, Nicole and Hayden form in the storage room. They don't have a name yet but it was pretty funny to watch it all come together. A few days later on the Live Feeds we learned they're calling their alliance 'Trilogy'. Wednesday's episode will cover the PoV competition and ceremony. They'll also show you the final two members of Team America, which we already know are Donny and Frankie with Derrick. We've got four days until the 2nd Live Eviction of the summer. Today we still have to see what Devin decides to do during the PoV ceremony. The feeds come back on Monday around 1:00 PM BBT and we learn that Devin did use the PoV to remove Brittany from the block and replaced her with Devin. Chaos ensues. We see Zach and Frankie talking in the have-not room. It sounds like Zach followed through with his plan to put Caleb, Devin, Frankie and anyone else on blast. Zach says he's cool with Frankie but Frankie pissed at whatever happened during that veto ceremony, saying he didn't have to get so personal. Pao Pao throwing the Battle of the Block competition must have come up because Pao Pao is on fire in the Fire room. 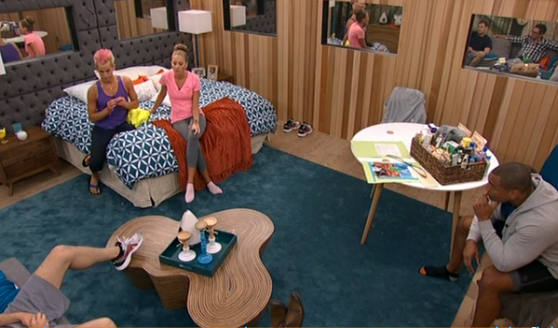 She's talking to Nicole about the comp and saying she didn't throw it at all. Pao Pao is telling Brittany everyone will be voting for Zach after what we said about her during her speech at the veto ceremony. Then Pao Pao and Zach are talking in the Hive Room about everyone being against Devin after the ceremony. That ceremony set off a bomb in the BB16 house. Derrick and Frankie have a Team America meeting in the backyard. Derrick says they have to stick together now that Zach blew up the Bomb Squad. Cody, Amber and Derrick are in the backyard talking about how Zach went to far in his speech about Devin's daughter and drug history. Most of the HG's feel the same way, sounds like it got a bit uncomfortable. Frankie tells Amber Christine and Devin in the storage room that Zach has to go for exposing the Bomb Squad to Hayden, among other things. Caleb is now saying that by putting up an alliance member, Devin has lost his trust in the house and plans on keeping Zach. The votes currently look to be in favor of Zach staying but that will probably change a few times before Thursday. The votes for Zach right now seem to be Cody, Hayden, Derrick, Nicole, Donny and Brittany for sure. Christine and Jocasta could vote for him as well. Not sure about Victoria, and Frankie, Caleb and Amber seem to want Zach out. Frankie and Devin are up in the HOH room. 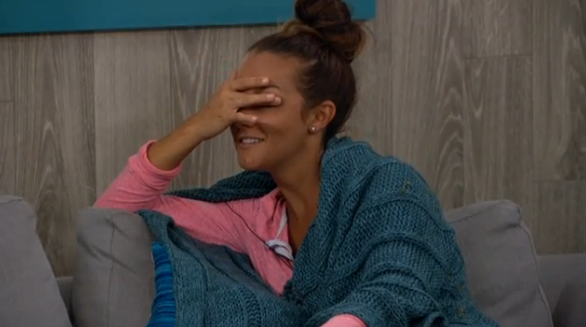 Frankie saying he's planning on blindsiding Zach with his vote while Devin is talking about legitimately liking Brittany now. Such a like-fest going on this season. The Night is filled with talk about whether Zach or Pao Pao should be the next voted out. It looks like we'll have close to a split house at this point. Christine seems to be the vote that will keep Zach in the house right now. At the end of the night it looks like Zach is safe and the 3 votes against him will be Caleb, Amber and Frankie, but things can change so easily. Zach had a nice conversation with Victoria late night and seems to have her vote locked up. He was also campaigning late night to Christine, Nicole and Hayden. Before the night ends, around 4:30 AM BBT, Devin tells Brittany that he "likes" her and is short with her because he's shy. We've now had two extremely uncomfortable confessions in the HOH room from Devin and Caleb. A few HG's are still up early Tuesday morning. Nicole is in the backyard talking to Victoria and Brittany saying that if Zach goes that she, Cody and Hayden are gone next. Nicole and Brittany both say they are voting to keep Zach in the house. Once Victoria heads inside they talk about making sure she votes to keep Zach as well. Cody and Zach are still up playing pool at 7 AM BBT. Cody says before the live vote he's going to go up to Amber and tell her everyone is voting to keep Zach. Christine talking to Frankie in the bathroom says that she's done playing Devin and Caleb's game and is voting to keep Zach. Frankie has to be realizing it may not be worth it to fight against Zach at this point. Victoria and Christine now talking in the bathroom and Vic says after she found out Amber wanted her evicted that she's now on board to go against her, Caleb and Devin. Both agree they would be coming after Zach next week if they won anyways. By later in the night on Tuesday it seems certain that Zach is staying. Nicole tells Cody that they have the votes but might want someone to vote for Zach to throw off the other side of the house. Cody would like it to be a 9-3 vote. Cody later tells Zach that the other side of the house is running around saying they have the votes to evict Zach but they don't actually have any except for the three of them. Derrick has a talk with Caleb and convinces him that it's best for them to keep Zach in the house. The rule is that if Zach wins HOH he can't nominate Caleb and he can't go after Devin for two weeks, Zach agrees. Caleb says he'll get his side of the house to vote for Zach to stay. 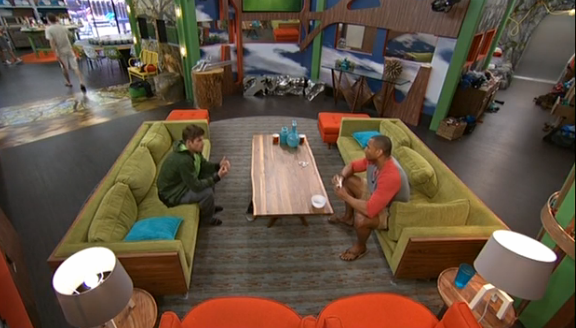 Derrick is now telling Zach he can sleep easy with a 12-0 vote coming on Thursday. 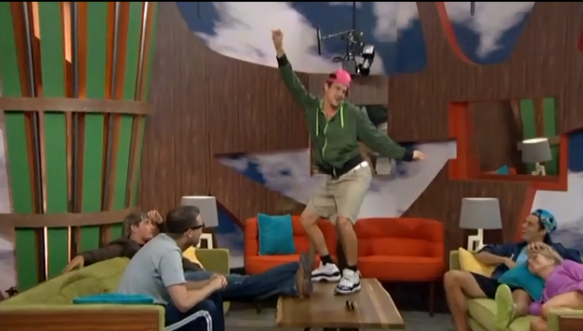 Zach, Frankie and Derrick joke that the Bomb Squad is back and with 9 members now. As of now, Pao Pao will be the 2nd HG evicted from the BB16 house. That wraps up our third Did You Catch That!? article. We still have 2 more days of game talk before the eviction Thursday night so anything can change but it would take a lot to have Paola stay in the house this week. Tomorrow night's episode will cover the PoV competition and a PoV Ceremony you do NOT want to miss!